What is the world’s fastest motor kayak? The world’s fastest motorized kayak is the Wavewalk S4, propelled by a 9.8 HP Tohatsu outboard motor. The S4 can go at a 17 mph speed (27 kmh) when propelled by a 9.8 HP motor, with only the driver on board. What is the world’s speed record for kayaks? The current kayak speed record is 17 mph (27 kmh). This speed record was achieved by Captain Larry Jarboe, in Key Largo, on January 17th, 2018, in a Wavewalk S4 outfitted with a 9.8 HP outboard motor. The factors that contribute to a kayak’s speed are its Size, Weight, Dimensions, and Propulsion. Human Powered: In a paddling or pedaling mode on flat water, mono-hull kayaks with a high Length to Beam (L/B) ratio, namely very long and narrow kayaks, are generally faster than kayaks with a low L/B, which are more stable. In choppy water, the kayak’s Stability and Balancing capabilities offered to its crew play a more important role. Motorized: At high speeds, such as when the kayak is motorized by a powerful outboard motor, Stability and Balancing capabilities are the dominant speed factors, as the kayak moves in a planing mode and no longer in a displacement mode – The stabler the kayak, the easier and safer it is for its driver to drive it at high speed. Additionally, kayaks that offer their driver to drive while seated closer to the motor are safer and easier to drive than kayaks that have the driver separated from the outboard motor by a longer distance. Why is stability a key factor for speed? Stability is defined as resistance to change. A kayak driven at high speed can flip over more easily than at a lower speed, and better lateral stability means that it can be driven at higher speeds with a lesser risk of overturning. The world’s most stable kayak is the Wavewalk S4. It is the only kayak that enables a 200 lbs full-size adult to stand on one side of the kayak with both feet, and turn around themselves as if they stood on the deck of a full-size boat. 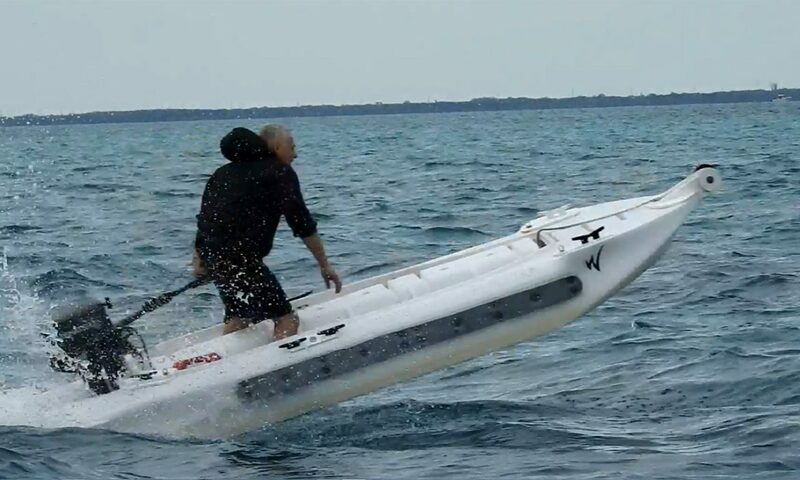 It is also the only kayak that can be driven at high speed in rough water, namely the most seaworthy kayak. This unmatched stability results from the fact that the S4 features a patented twin hull. In this full fledged, true catamaran form, the boat’s volume is distributed along its left and right sides, where it is the most effective in offering maximum buoyancy and therefore best support for the shifting weight of both passengers and gear. This optimal performance is in contrast to other kayaks that feature conventional mono-hulls, where the hull’s volume is concentrated along the boat’s center line in a way that makes it the least effective in stability terms. Why is balancing capability a key factor for kayak speed? Being a small vessel, a kayak is inherently less stable than bigger boats, and therefore the ability of the kayak’s user(s) to balance themselves and their kayak effectively is key factor in the kayak’s overall stability. Balancing capability is a key ergonomic factor for driving many types of small vehicles, both human powered and motorized. It is particularly important in bicycles and motorcycles that offer no stability of their own, and therefore depend entirely on their users’ ability to balance them. Other vehicles that offer their users good balancing capabilities are All-Terrain Vehicles (ATV), snowmobiles, and Personal Watercraft (PWC). What gives a kayak user better balancing capabilities? A type of seat known as a Saddle is what all the above listed vehicles have in common. A saddle allows the user to balance themselves with their legs straddling the seat, in a manner similar to horse riding. The user straddling the saddle seat can easily and swiftly shift their weight from one leg to another, in a way that resembles balancing while running and jumping, namely more naturally, intuitively, and effectively than when seated in other positions, such as on a bench, swivel seat, chair, or in the notoriously uncomfortable and unstable L kayaking position. What makes the Wavewalk S4 faster than other kayaks? The Wavewalk S4 is the world’s fastest motorized kayak due to the fact that it is the world’s most stable kayak. This urivaled stability is made possible thanks to its twin-hull (catamaran hulls) and the ability of its crew to balance themselves effectively while riding a saddle seat, similarly to the way that Personal Watercraft (PWC) and other high performance vehicles (e.g. motorcycles, ATVs, snowmobiles) balance themselves and their vehicles. What are the advantages of a fast kayak? The main advantages of a faster kayak is that it saves you time when you want to get somewhere, such as a productive fishery, and it makes it possible for you to access remote locations. In addition, speed is enjoyable, and driving a fast kayak is fun. Practically speaking, a fast and stable kayak that’s also highly seaworthy presents the advantages of a microskiff (micro skiff), in addition to being a car-top boat, and the ability to carry it to and from the beach, without depending on boat ramps. And, of course, it’s also the most roomy, stable and comfortable for fishing when propelled by human motor.